I am absolutely in love with this jacket from Primark and for only £25 it was an absolute steal!! I can only hope they still have it in store as it is one of my staple pieces for spring this year. I layered it with one of Next's basic long sleeve t-shirts which fit like a glove (even when you're tall like me), and topped it off with my favourite statement necklaces I bought from Primark a few months back. 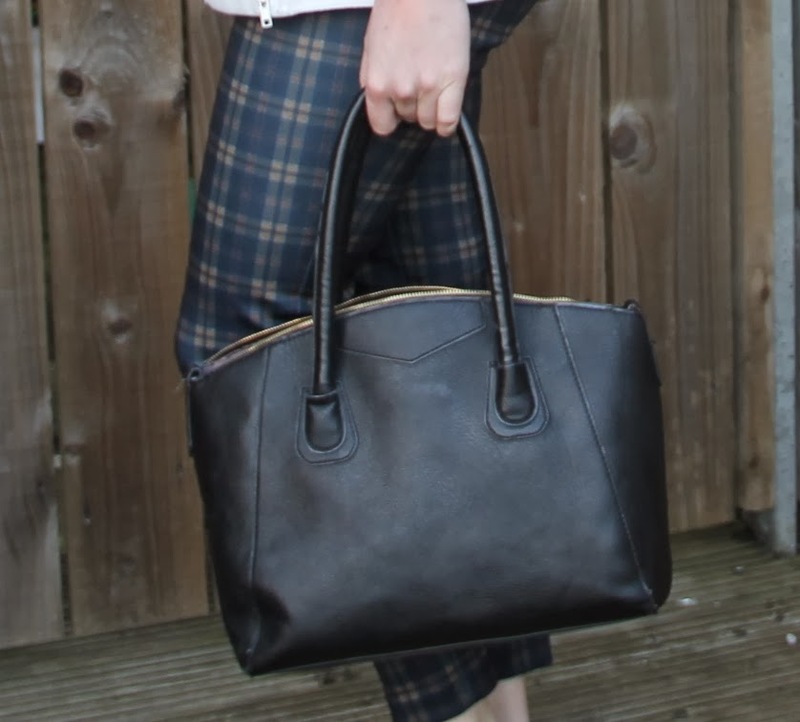 I found these gorgeous navy tartan trousers in the sale at Zara tucked at the back of the rail hanging alone - regardless of the fact they were a tad too big I couldn't say no. Although I'm now regretting this after joining Slimming World they're a little baggier around the knees than I expected... I highly doubt they are still selling these which really is a shame as the quality of them are fab and they are easily dressed down for a casual day or paired with chunky heels for classy an evening look. I added these gorgeous, black loafers from Next which took forever to break in but since then they have not left my feet!! They are so comfy and versatile and I feel they bring together any outfit. Last but not least I added this simple black bag, which also comes with a long body strap for those who carry too much in their bag - of this I am also guilty.. I got it from eBay a long, long time ago however there are so many similar ones and some even nicer if you just search "black tote bag" almost all my bags are from eBay as I love how cheap they are and the quality is so impressive - I'm yet to have any of mine break on me.